At the heart of every great European city is a flourishing flower market. Gorgeous fresh roses, lilies, carnations and more, our bestselling field-gathered bouquet designed in a glass vase & tied with raffia, brings a romantic taste of Old World charm to every Spring celebration. Colors and flowers may vary. 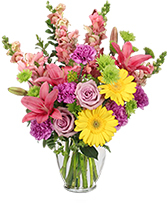 Sending an arrangement of bright, colorful flowers is the perfect way to bring a little unexpected joy to a loved one, co-worker or friend this spring and summer. 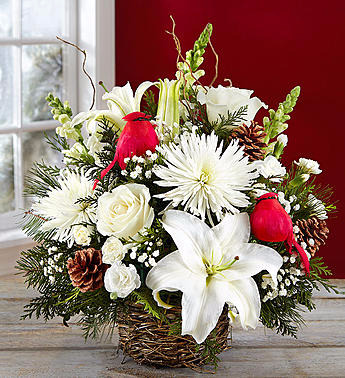 Make a splash with this bouquet of roses, snapdragons, lilies, and carnations. ****Colors & flowers may vary due to availability. Have fun and celebrate summer with purple carnations, lavender stock, mini orange spray roses, green hypericum, and a cheerful orange lily. Order these sensational summer flowers and put a smile on their face! ***Flowers & colors may vary due to current availability.